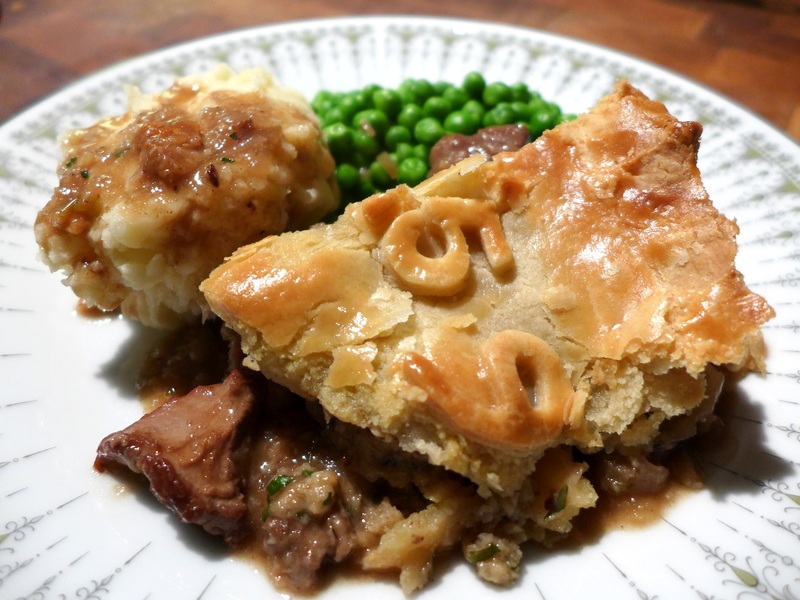 I’m finishing with a flourish and a rather magnificent Minted Lamb Pie, inspired by a mutton pie from Eliza Acton. Her book, Modern Cookery for Private Families, first published in 1845, is one I refer to often and I’m not alone in that. Mrs Beeton nicked loads of her recipes, unattributed. I’ve used shoulder of lamb rather than mutton, which can be hard to get hold of these days, but I have retained Miss Acton’s suggestion of using forcemeat in the pie. The stuffing balls bulk out the meat to feed more people but equally importantly they add a different texture and flavour. Think stew, dumplings and pastry. Yum. That ripping noise you hear is my jeans but they died happy. The pie filling, pastry and forcemeat balls can be made a day ahead and refrigerated. Please note that herbs vary in strength from place to place and season to season, so use your own judgement as to quantities. 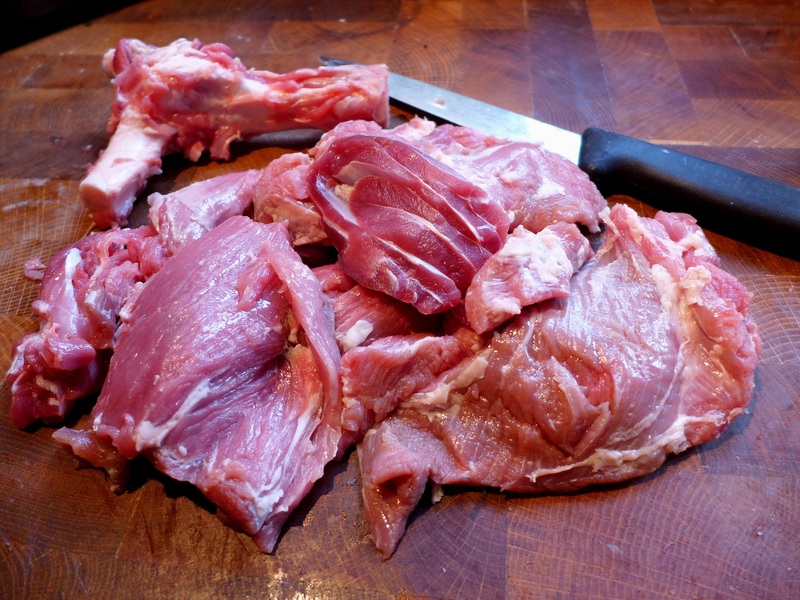 If you’re starting with half a shoulder, as I was, remove the bone and save it for your dog/your friend’s dog. Trim the meat of any skin and fat and cut into bite-sized chunks. 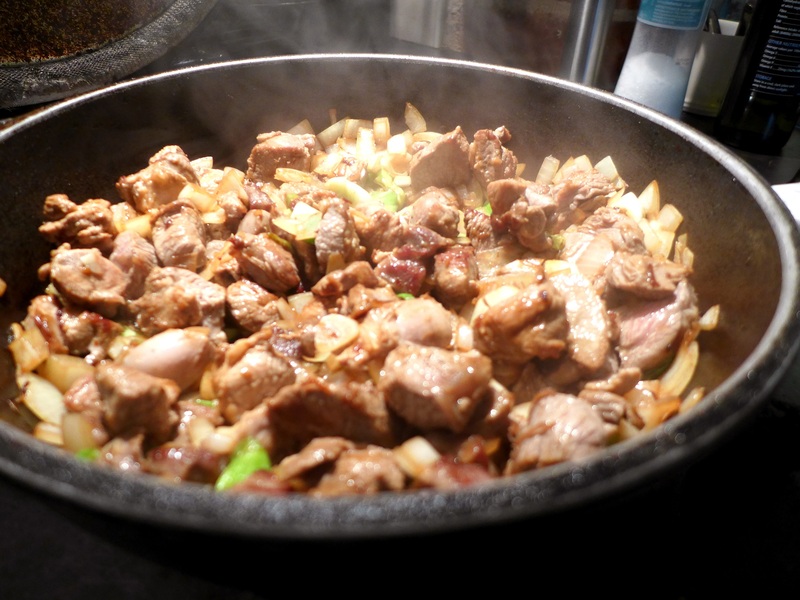 Heat a few tablespoons of oil in a deep frying pan or casserole and brown the meat, a few pieces at a time. Set aside and in the same pan, cook the vegetables until soft and golden. Put the lamb back in the pan with any of its juices. Stir in the flour and allow it to cook for a minute or two, then pour in the red wine and stir it in, scraping up all the brown bits from the bottom of the pan. Add the stock and herbs, stir well and season with salt and pepper. Bring to a boil, put on a lid and cook gently until the meat is tender. Mine took an hour in the bottom of the Aga (which is hotter than most Aga bottom ovens) but you can simmer it on a low heat on the stove if you prefer, stirring occasionally. Keep an eye on the level of liquid. When it’s done, remove from the oven, check the seasoning and allow to cool completely. To make the pastry, put the flour and salt in a big bowl and rub in the fats. Add the egg and egg yolk and cut it in until the pastry leaves the sides of the bowl cleanly. Knead briefly to remove any cracks, form it into a ball, wrap in cling film and refrigerate for at least half an hour. Take it out 10 minutes before you roll it. 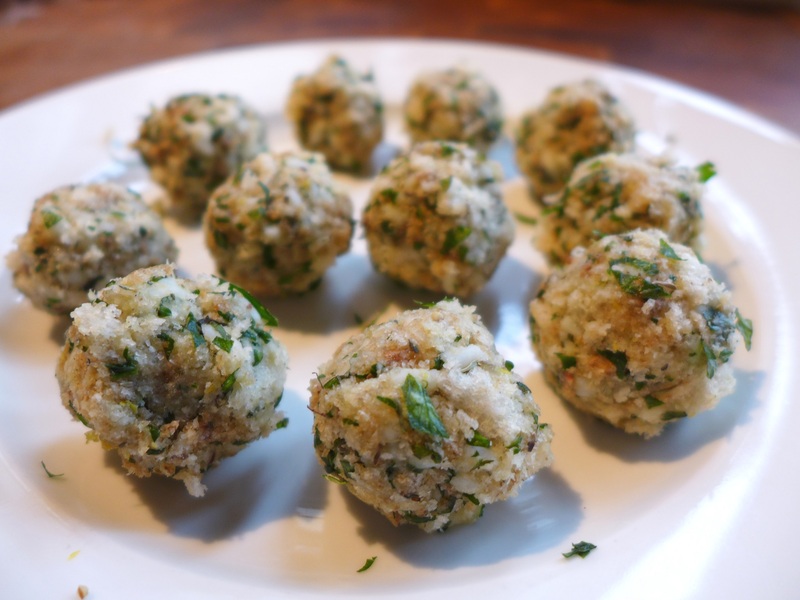 To make the forcemeat balls, put the ingredients in a bowl and bind with the beaten egg. Form into small balls about the size of a walnut. Pre-heat the oven to 425F/220C/Gas Mark 7. Spoon the filling into a deep pie dish of about 23 cm diameter and arrange the forcemeat balls on top so they’ll support the lid, nestling them gently into the filling. Roll out the pastry until it’s about 2.5 cm bigger than the diameter of your pie dish. Cut off a thin strip from the edge and brush it with water or beaten egg. Place it round the rim of the dish. Brush again and place the lid on top, pressing the edges to seal and crimping to give an attractive finish. Glaze with beaten egg. Use the pastry trimmings to make decorations for the pie top and egg wash those too. Bake the pie in the centre of the oven for 15 minutes. Then reduce the temperature to 190C/375F/Gas Mark 5 and cook for another 15-20 minutes or until the filling is hot and the pastry is golden and crisp. 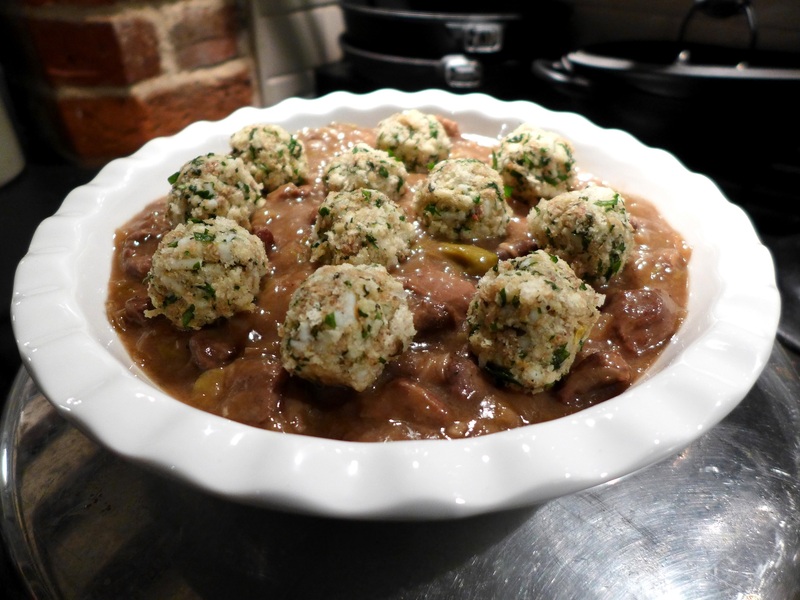 This entry was posted in Lamb and kid, Mains and tagged British Pie Week, forcemeat balls, lamb pie, minted lamb pie, minted lamb pie with forcemeat balls, stuffing balls by Linda Duffin. Bookmark the permalink. I’ve ticked the ‘like’ box in solidarity. It looks a good recipe, but only if you’ve spent the morning digging roads in a chain gang. I don’t think my lifestyle is active enough to justify it. Perhaps I’ll just nick some wine from that bottle you just opened for the recipe? 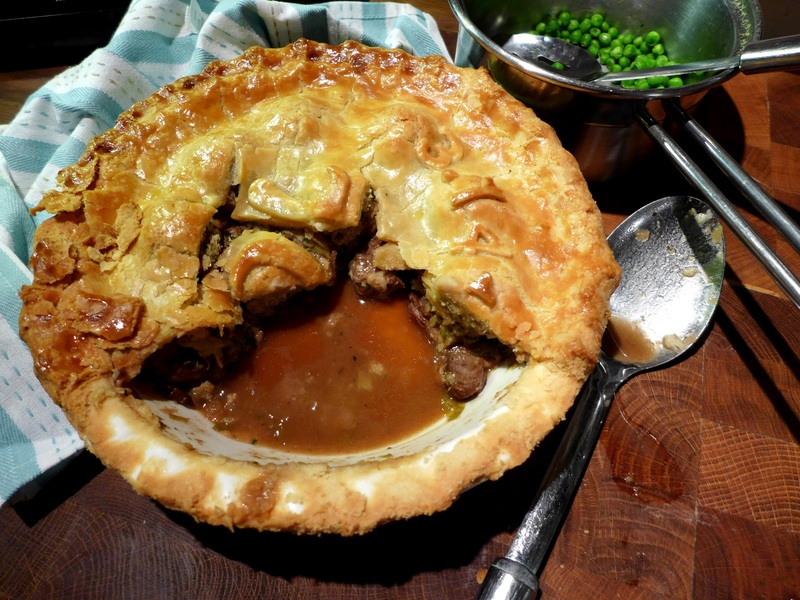 I love that you’ve added the forcemeat into your pie – that’s a cracking idea! And the pie pastry is perfection personified. 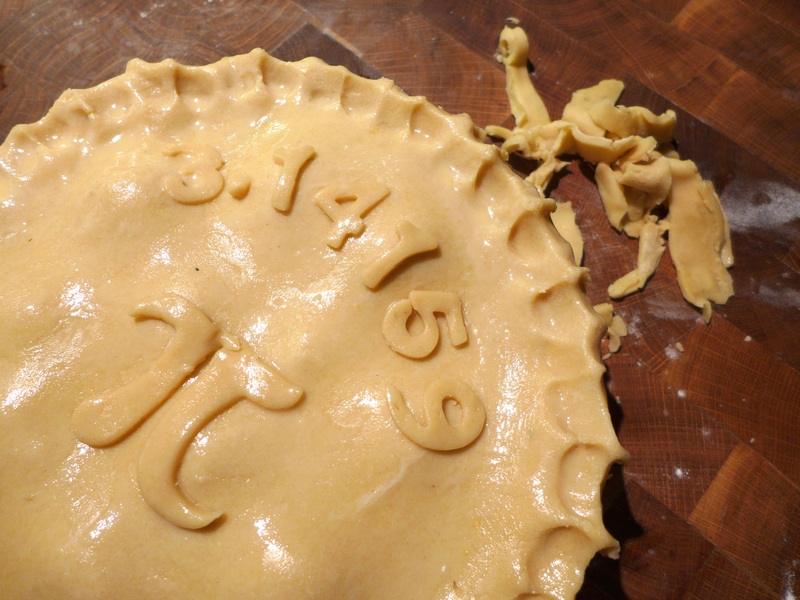 I often stick π on my pies too 😀 but I’ve not gone so far as to add the digits to five decimal places! So THAT’s why Him Outdoors likes pies! Another fab pie! Great idea putting the stuffing balls in the pie! Thanks again, Jacquie. I have Miss Acton to thank for that idea, although she layered hers.This way they puff up beautifully and are very light (and have the added bonus of holding the crust off the wet filling). It’s not enough that this post reignited my serious case of pie crust envy. Now I’m off to begin the quest for suet. I’ve never seen it anywhere and think I’d have to go to one of the older butcher shops in town. I’ve not seen mutton either but let’s take one thing at a time. Both are great dishes, Linda, and your pie series has been fantastic!